Since Ann is our go-to person for brilliant baby shower game ideas, it was challenging to think of something new she would not have seen before. 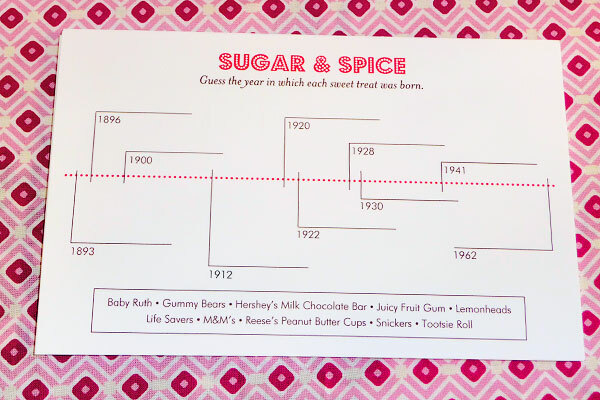 Sticking with our sweet theme, we came up with a Sugar & Spice Timeline where everyone had to guess the year in which famous candies were born. 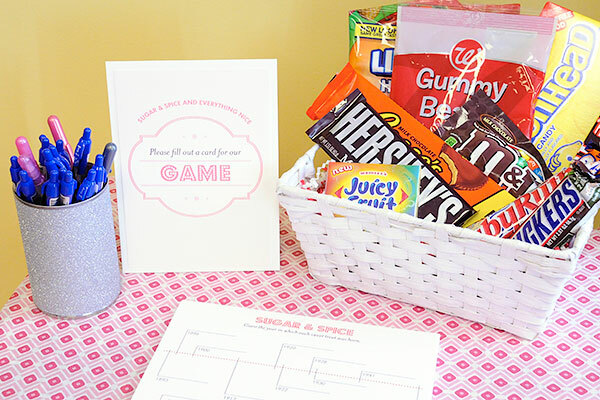 A simple game card and a basket of the highlighted goodies (which also served as the prize for the winner) is all it took! Latest fave: Personalized Note Pads! Our friends on Facebook have inquired about the answers to this baby shower game. Here is what we came up with, but the information for these and other candies is easy to find online! This is a great baby shower game. Sweeeet… Idea!! Thanks for sharing. This is great idea! I need to use this for an upcoming shower. Question: How long did you give the ladies to guess on this? & how many did the winner get right? (It’s just because they could google these on their cellphones – cheating, Lol!) Thanks!